For eight years, one of the most significant rock formation in RNMP had stared us in the face every time we’ve ventured into Glacier Gorge, and yet, we’d never thought to venture onto its features. Primarily, our lack of attention was due to the very long approach, but in some important way, its forbidding and committing look was also a deterrent. The Northwest Face of Chiefs Head is one of the finest alpine walls in the contiguous United States. The immense and unusally smooth oval face rises a thousand feet…and is home to some very aesthetic and very hairy routes. All of the routes have long runouts and no fixed anchors[.] In the event of storm…it is very difficult to escape. How about “Much Ado About Nothing”. This is about the only climb on Chiefshead that isn’t 5.10 or above. It’s way right of the big wall, and has five pitches, with the last one 5.8. Descent may be most interesting part. 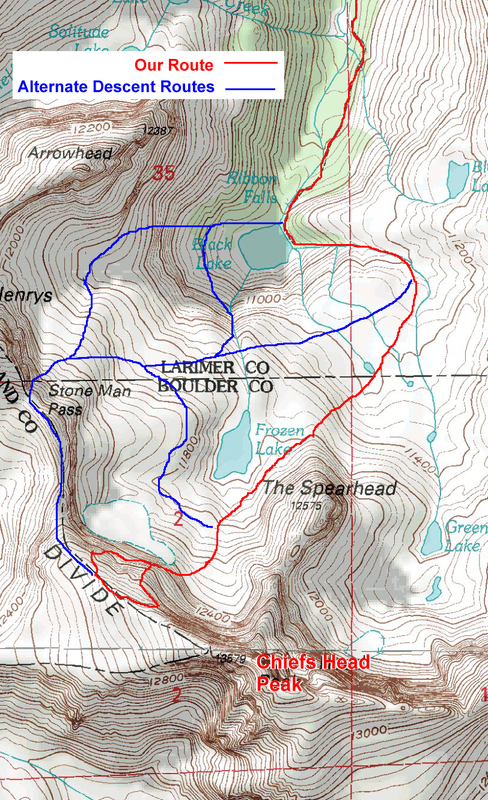 Stoneman could be done, but it would be a long way back to pick up packs. Rositer recommends rapping down his Birds of Prey route, but first you have to find it. And find it empty. The third choice is a third class route much closer than Stoneman. Finding that route could be valuable knowledge. Forgot to mention: this climb gets no star in the book. But I thought it would be worth it to do something on that mountain. I wondered about the “no star” thing, but was already enthusiastic about the climb. They say, ignorance is bliss, at least for a while. Soon, we’d find out just how wise it is to be afraid of Chiefs Head’s Northwest Face. We find out just how hard Chiefs Head climbs really are, even a mere 5.8 route. 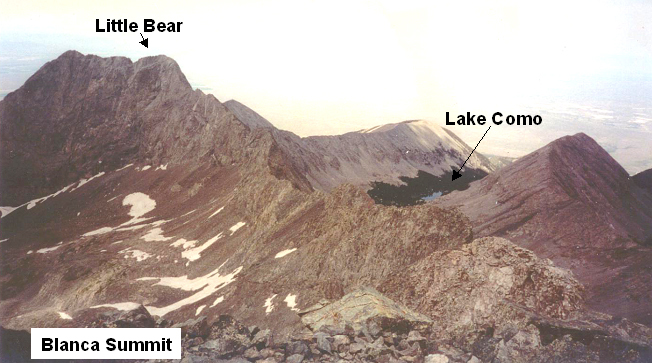 On the morning of August 23, 2003, we caught the 5am shuttle bus (earliest available) to travel up Bear Lake road as we set out for the far end of Glacier Gorge. We had to hike approximately 7 miles and over 3,000 vertical feet just to reach the start of the climb: we hiked up past Black Lake, over the north shoulder of Spearhead, past Frozen Lake and beneath the west face of Spearhead, and then we scrambled up a rocky shelf before crawling up the snowy talus to reach the northwest face of Chiefs Head. Then, we turned west and climbed up the snowy ramp to reach the base of the climb. It was a brutal 3.5 hours; and we hadn’t even started the climb. Prior to reaching the base of the climb, we stopped for a moment of study while we could still see the entire wall. The key was the figure of a head that would guide us to know where to start and where to aim during the initial pitches. We were looking at shadowy patches trying to find one that looked like a head; Brian claimed to be able to see an “Indian’s head” but I could not. But with a target in hand, we finished the approach. Just before 9am, we started up the Much Ado About Nothing route on Chiefs Head’s Northwest Face. I took the first pitch and climbed over steep, broken ground that was supposed to end at the base of a “head” I could not see. I could do no more than take out as much rope as I could and find a good spot to belay. Brian took the second pitch, following huge broken flakes that provided small left-facing dihedrals on their left side. He finished over some easy ledges and belayed at the base of a left leaning ramp. At this time we noticed that the weather was worsening; our view west was blocked, but the sky above was clouding up and darkening. We knew we had to hurry since the crux was still ahead. I took the third pitch which was to climb the ramp leading up and left angling toward a big dark roof that stretched for more than a pitch as it arched left. To save some time on an easier section, we decided to simul-climb. Using the ramp to travel diagonally under the roof started out easy, but then steepened. And then the rain started. It was a only a drizzle, but now we were in it. It was approximately 12pm. The crux of the climb was still ahead; I knew we had to get past the slabby crux before the lichen turned into grease. I put in a quick belay with about 1/2 a pitch of the roof remaining so Brian and I could put on our rain jackets. We then moved the belay to below the crux pitch so Brian could race the weather past the crux. Just as Brian arrived at the end of the ramp, the rain began again in earnest. We could see the next ramp approximately 30 feet above us; Brian had to get there before the rock became unclimbable as well as unprotectable (a slab). He started quickly but soon slowed as the rock was quickly getting slick. As I sat in the freezing rain, I could feel the water soak thorugh my rain jacket. As I watched Brian slowly working his way up, hoping he wouldn’t take a long fall, and as I got colder and colder as my clothes became more and more wet, I came to understand just how important it is to have proper gear when venturing into hard to escape terrain. Apparently, my windproof, water resistant, insulated and wonderfully packable North Face jacket was not up to the challenge of a real Alpine adventure. I was going to suffer terribly as a result. Brian decided to stop before the ramp, but after the hard section, to allow me to get past the crux before it became too wet. But it was too late, the rock was completely drenched, and I was certain I could not climb the rock. I was mentally prepared to “fall up” over the slick rock. And it was like climbing a greased slope, but 3 points of contact allowed me to cling to the rock like a spider in the shower. Once I reached Brian, we quickly moved the belay up to the ramp so we could figure out where we were. We were very confused because, according to the information we had collected, we should be at the summit ridge already. But there was no summit ridge in sight. 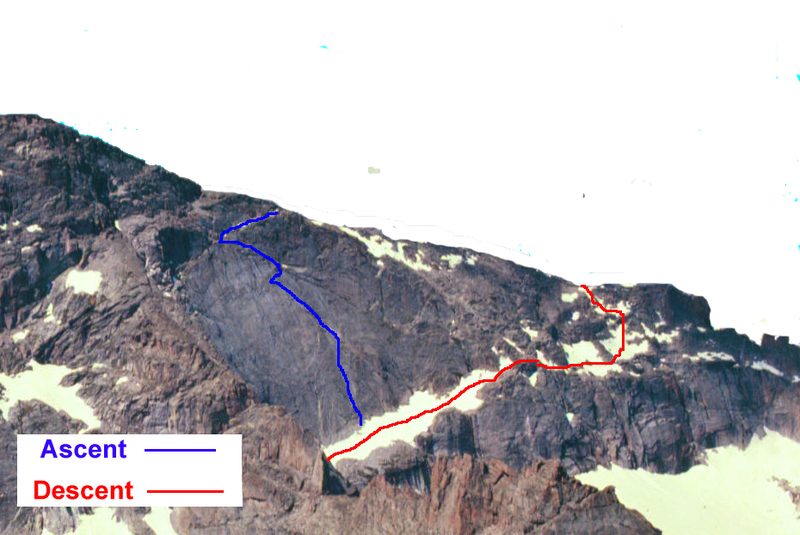 It turned out that Rossiter’s topo only showed the unbroken portion of rock that was set into and below the full NW face. We didn’t have any certain knowledge or clue as to how to get to the summit ridge. All we could do was follow the ramp we were on and then follow our noses to try to find the rappel anchors or at worst take the summit ridge down to either Stone Man Pass or find the mysterious “broken ramp” that Rossiter described as an ascent route to the right of the Much Ado About Nothing route. But first things first. I took the lead for a simul-climb of the ramp. After a couple hundred feet with no rap anchors or anything else looking promising, I found a right leaning ramp that promised to intercept the ridge as it sloped down. Desperate for any escape, I abandoned the search for rap anchors and took the right leaning ramp. It went, and I was able to piece together a climb off the face. While I was sopping wet and freezing cold, I now had control over my fate; I knew that I knew how to get home. I just needed to escape Glacier Gorge before it got dark; it was approximately 3pm. Much Ado About Nothing route plus descent. 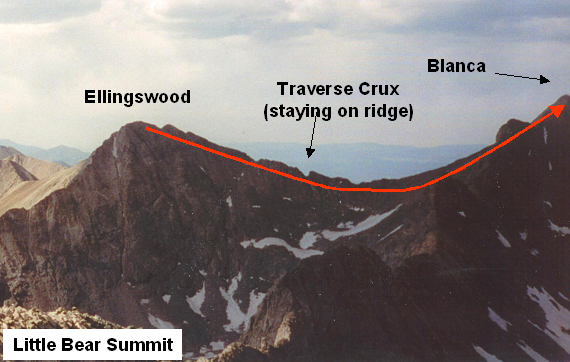 Photo from Longs Peak of Chiefs Head edited to highlight Chiefs Head features by removing other peaks (e,g,m Mt. Alice) from the background. Shivering with no hope of getting warm, I had no intention of continuing to the Chiefs Head summit. I wouldn’t have done it even if I had never stood on top of Chiefs Head. I felt that my life was in play and wanted to take no unnecessary chances. Brian thought he could find the gully that Rossiter described as an ascent route; from a safety, time & energy management perspective, we desperately wanted to avoid going all the way around to and down Stone Man pass. We hiked down the much of the NW Ridge to find a likely big gully to descend. It was more like a series of steep gullies that would work for 40 feet, then we would have to find ledge that would allow us to traverse to another gully. We kept trying to turn back to the east where the climb started, but each time all we could see was a difficult ledge heading east and then a rock rib would prevent us from seeing whether the ledge continued. Brian said it reminded him of Pyramid Peak. Eventually Brian found a ledge that led out to the biggest rib, and from there he could see the start of the climb, and sloping, rubble-covered ramps leading down to it. We scrambled down and followed it until the terrain started to break up; a path to the right appeared and we took it, hoping it would lead to the snowy ramp we started on. We had to retrace our steps a couple times as we’d cliff out, and then we split up to double our chances of finding an escape path. Eventually Brian found a path through tumble that worked. It was approximately 5pm. Three hours of light left. We packed up our gear and headed down as fast as we could manage. We were going to get caught out by darkness; it was only a question of how much hard hiking we had to do in the dark without headlamps. We retraced our steps so not to introduce any new variables, and we made it to within a quarter mile of the Bear Lake road before it became too dark to see what we were doing. Since the buses ran until 10pm, we took our time creeping in the dark to find the Bear Lake road. Once there, we started downhill and found a small group of people standing by the road. We confirmed that it was the bus stop and then we layed down on the pavement to wait for its arrival. We had spent our last ounce of energy. We made it. We had hiked 15 miles, and climbed nearly 4,000′ in over 15.5 hours. And this time we had overcome serious route finding problems, freezing rain, and one serious case of rain gear stupidity to make it home once again. It was a glorious adventure.